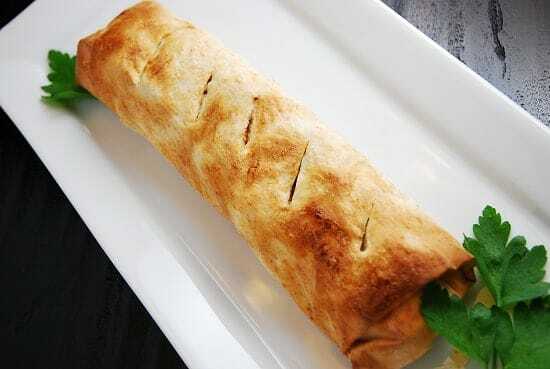 Often when I have Friday night dinner with my group of friends and their family, my friend Hailey usually makes her “Beef Bourekas Log”, which is a Mediterranean savory, beef filled pastry that is seasoned with spices such as cinnamon and allspice. It is SO unbelievably good. I decided to take a crack at making a lower calorie version that was still just as tasty. I was thrilled with how delicious my Moroccan Ground Turkey Bourekas Log turned out! By using a bit less of the phyllo dough and using ground turkey instead of beef, I was able to cut way back on the Weight Watchers Points of this recipe. I also added in some sweet potato to make the inside mixture more soft and moist, and to add some more fiber and nutrients. It was delish. Working with ground turkey can get a bit tricky sometimes because the meat has such little fat, it can very easily become dry and crumbly. One of my secrets is to keep adding some chicken broth, bit by bit, while cooking it. It softens the meat without adding more fat and calories. And it keeps the meat from sticking to the pan so that I don’t have to add in more oil/fat. So if you are looking for a unique ground turkey recipe to try that is incredibly satiating, this is the one. Thanks for the inspiration, Hailey! A healthier twist on a traditional Moroccan Cigars Recipe, this version is made with ground turkey but still has all the delicious flavors that are expected. Savory, with a hint of sweetness, it’s a perfect appetizer recipe, or can even be served as the main course. Spay a large, nonstick skillet with non-fat cooking spray and set over medium high heat. Add in onions and garlic and sauté until tender, about 2-3 minutes. Add in ground turkey, and cook while breaking it up with a wooden spoon. Add in chicken broth while cooking to keep meat from sticking to pan. Add in grated sweet potato, cumin, parsley, paprika, cinnamon, allspice, salt and pepper. Taste, and add additional seasonings if desired. Cook until turkey is browned. Remove from heat and set aside. Remove phyllo sheets from package, and start by laying out two sheets, on top of each other, on a large flat surface. Add 1/3 of the cooked ground turkey to one end of the phyllo sheets, and roll up like a burrito. Repeat this method to make two more logs. Line a baking sheet with parchment paper and spray with non-fat cooking spray. Place logs on baking sheet, and brush tops with melted butter. Bake at 350 degrees for about 20 minutes until golden brown. so this is one of my favourite recipes and have been making it for years on a regular basis. I discovered if you make smaller parcels and freeze them un- cooked they make great ready made meals. I just pop them straight in the oven from frozen and cook a little longer. As I make these so often, and am back on my WW journey, I converted them to smart points on the ww webiste for you: they are 6 smart points per serve! Says serving is 1/2 a log but there are 6 servings that this makes. Does the entire recipe make 3 logs total? Yes, that is correct…the recipe should make 3 logs. When do you add the chopped parsley? Thanks for catching this!!! You add in in Step 3…I just corrected the original post. This looks really good – I have just started to make it – but when do I add the parsley? What about using ground buffalo…it is a lean meat and all I use in place of hamburger.